Our name, Chimayo, derives from the sacred location (pictured above) in New Mexico. Situated in the foothills of the Sangre de Cristo Mountains, the village of Chimayo, New Mexico is just 40 minutes from Santa Fe, along The High Road to Taos Scenic Byway. This special place is known for its beautiful historic church, but also features several weaving shops and delicious food. El Santuario de Chimayo is known for its side chapel where the dirt floor is reputed to have healing powers. Every Good Friday, tens of thousands of pilgrims make their way to this “Lourdes of the Southwest". We have worked to ensure that when you step through our doors, our ambiance will transport you to this beautiful place. From festive lighting, wrought iron detail, Southwestern throw pillows in each booth and an authentic Mexican tile floor create this fabulous illusion. Arturo Flores is one of Bill White Enterprises’ longest-standing and most loyal employees. His career with the company and his first job in a kitchen began about 20 years ago, when he was hired to work at Grappa as a dishwasher. 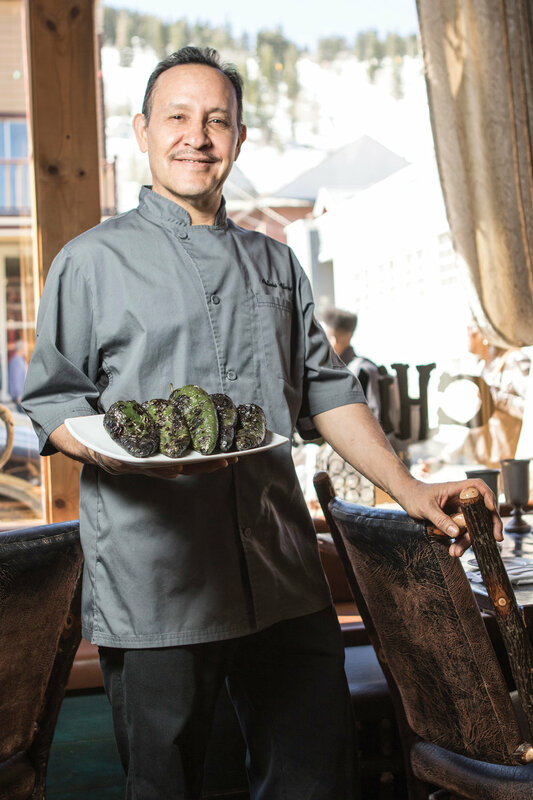 Now the Executive Chef of Chimayo Southwestern Restaurant, Flores’ journey with the company, and as a chef, is an incredible story of success and dedication. Moving to the United States from Mexico in 1993 after completing law school, Flores originally thought he would return to Mexico after working and saving money for six months to pursue a career in law. Realizing that his passion was not in the courts, but rather in the kitchen, Flores decided to follow his heart and make a more permanent move to the US. Advancing to the position of Food Runner at Grappa after a short time, Arturo Flores’ interest in food and cooking began to blossom. Flores was quickly promoted to Expeditor and Prep Chef. During this time, Flores learned the basics of cooking, preparing sauces, plating food and expediting. Flores was brought on to work in White’s second restaurant venture, Chimayo Southwestern Restaurant, where he worked as an Expeditor and then Sous Chef before being promoted to Executive Chef in 2000. His love for his job and for cooking inspire him to work fervently, ensuring that his kitchen runs flawlessly. Although he has had no formal culinary training, Flores describes his advancement as a chef and within the company as attendance at “the school of Bill White.” Working closely with White for over two decades, Flores has continually had the opportunity to learn from his boss everything from technique to blending flavors to working with new ingredients. When given the opportunity to work in the kitchen with White on parties and events, Flores says that this is still one of his favorite parts of his job. Ever passionate, Flores believes that cooking is “something from the heart.” He enjoys creating new dishes and making menu changes to utilize seasonal ingredients and keep everything fresh.